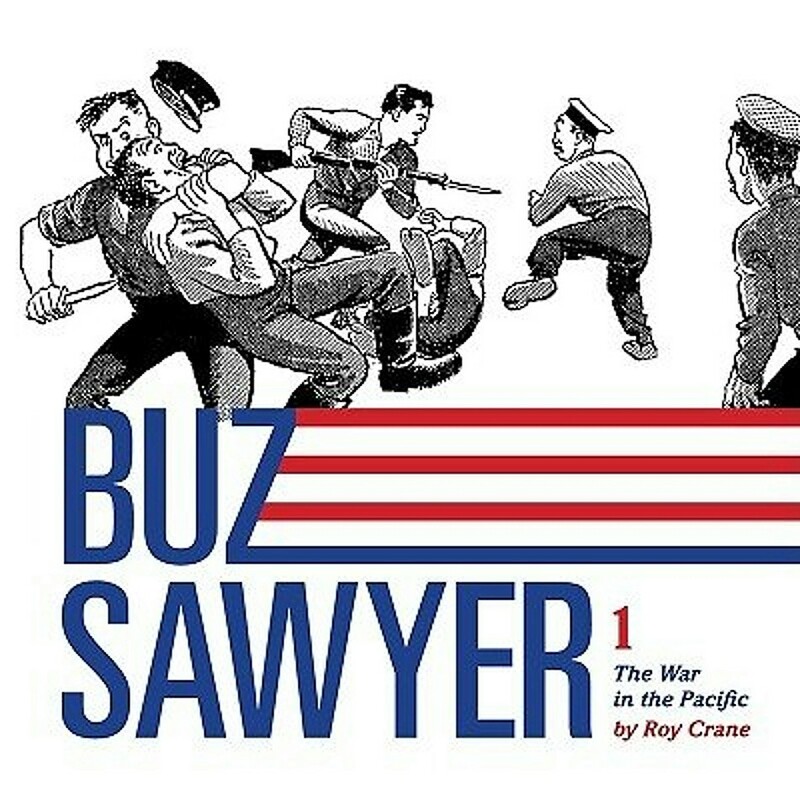 When I was reading it, BUZ SAWYER was an adventure strip featuring a lot of international intrigue, but when it started in 1943, it was a war yarn, as you might expect. Buz Sawyer is a young Navy pilot who flies a Douglass SBD Dauntless dive bomber off the aircraft carrier Tippecanoe in the South Pacific, along with his rear gunner/radioman Rosco Sweeney. After a few dogfights with Japanese Zeros, Buz and Sweeney are shot down and wind up on a Japanese-occupied island, along with a German planter who owned a plantation there before the war and his beautiful American stepdaughter (the first of many beautiful girls to be featured in this comic strip). Following that adventure, Buz is sent stateside for a 30-day leave and returns home to Willow Springs, U.S.A., taking a now recuperated Rosco Sweeney with him. He winds up in a romantic triangle with a local society deb who’s long had her eye on him and figures they’re going to get married, and the tomboyish girl next door who’s grown up into a lovely young woman. Nothing is resolved before Buz’s leave is up and he’s sent to a base in California to train on some new torpedo bombers before returning to combat status. He also runs afoul of a tyrannical new commanding officer, and things are complicated even more by a visit from the society girl who’s still after him. After that it’s more combat and some harrowing adventures, all the way to the end of the war and the unexpected return of an old friend . . . or is that an old enemy? This is an excellent collection of a comic strip that’s faded from most people’s memory. Roy Crane has often been compared to Milton Caniff, and there are definite similarities in the use of light and dark, the beautiful women, the exotic locations, the unmistakable air of high adventure. I still prefer Caniff—TERRY AND THE PIRATES will never be topped as an adventure strip—but Crane is very, very good and may be Caniff’s equal in the military stuff. I was a little surprised that the homefront storyline turned out to be my favorite in this volume. Sure, the plotting is a little hokey and predictable, pure soap opera, but Crane makes it work extremely well, thanks to some great dialogue and characterization. Those strips really capture the era and form a wonderful piece of Americana. There are several more volumes in this series, and I’m thinking I’ll read at least one more of them and maybe the whole run if the quality holds up. If you’re a comic strip fan and have never checked out BUZ SAWYER, or if you read the strip decades ago and remember it fondly, like me, I give this first volume a very high recommendation. I was a TERRY AND THE PIRATES fan, too. I haven't read BUZ SAWYER but it sounds good. Yeah, if you like Terry, you should enjoy Buz, too. I'm approx. the same age as you James, and we had some great strips back then. I loved getting the paper. So glad that many of these are showing up in collections now. Today's strips with jokes and one liners are really lacking the involvement of the stories we had. I was interested until I saw the prices of Vol 1 and the following three. The library is a bust too. Too bad, they look like a lot of fun.